In a country that is the abode of many Gods, often we emark on a journey to their doorsteps. We travel across lands, our hearts filled with faith and souls brimming with devotion. We endure difficult Yatras to catch one beautiful glimpse of the almighty. To bow before Him and seek his blessings. Begin your spiritual Pilgrimage with Yatra agarbattis. They are made from rich natural ingredients that are hand-picked from rare Indian forests. Then they are mixed and blended with pure natural fragrance oils which will calm the impetuous mind, relieve the fatigued body and stir the soul, hand-rolled, just like how the sadhus did in the ancient times. Invoke the supreme forces with its stirring fragrance. Appease the Lord. Make every wish come true. Light a stick, blow out the flame and enjoy the scent wafting around your space. Delve into the age old Indian tradition of burning incense – it helps in clearing the mind, heightens the awareness of self during meditation, and creates an aura of positive energy. It immortalizes you, it intensifies your thirst for desires, it unleashes your dark side. Rumor has it that Vampire’s Kiss is formulated by blood-thirsty vampires to aid their hunt for humans. This incense captivates mortals with its sensual smell, seducing the vampire’s prey as they sink their fangs deep into their necks. Once lit, it immediately transports you into a trance of pure bliss. Other effects include a strong longing towards the realm of the supernature. Burn at your own risk. 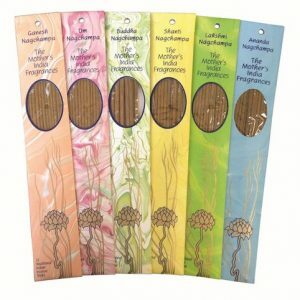 Sweet smelling incense produced by the company that makes the iconic blue-boxed Nag Champa. Helps reduce the negative and increase the positive aspects of each zodiac sign. Hand rolled in India. Smells just like Temples in India. An essence of divinity, holiness and purity – that’s what you smell when you light an Aroma Temple. This subtle yet distinct fragrance works like a charm to soothe your senses and create the perfect meditative ambience of a holy Indian temple. You can enjoy the goodness of its scent in any space as these sticks can serve as a potpourri as well. Experience the divine aura through this soulful smell! Smells Pure, Smells Alluring, Smells Absolutely Divine! Handrolled Incense, made according to the age-old masala method of creating a paste of all the ingrediants together with our Floral Perfume Oils have been widely recognized as among the very finest quality fragrance product available anywhere. 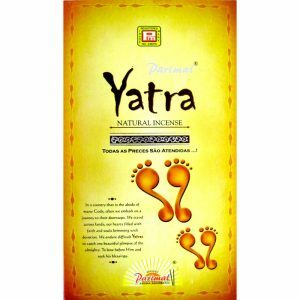 Mother’s Incense is a light, clean burning incense that creates a minimum of smoke, and slowly spreads a gentle aroma. 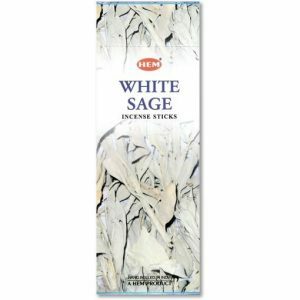 White Sage is a very sacred herb and originates in North America. Many use it to create an energetically clean space in your home or workplace.